What are the Advantages of a Constant Speed Propeller? A constant speed propeller is required to achieve the maximum performance of any high performance aircraft design. For example, how well do you think your car would perform if it was stuck in only one gear? Let's say you only had the equivalent of 1st gear, driving at 55 mph on the highway would not be possible or practical. Conversely, how about starting from a stop in 5th gear? If possible, the acceleration would be anything but ideal. This is exactly what takes place with any airplane operating with a fixed pitch propeller. The typical aircraft engine will develop full power around 2700 rpm, but it is not uncommon for a fixed pitch cruise propeller to only turn up 2100-2200 rpm's on take off. This means the airplane is only able to use 65% of its maximum horsepower available on take-off, and this is when you need horsepower the most! With the same fixed pitch propeller, a 260 hp engine will only develop slightly over 170 hp, radically and adversely affecting T/O performance. It doesn't matter how fast your new speed machine is if it can't clear the trees at the end of the runway! Now, can you imagine how your airplane will accelerate and take-off with an extra 90 to 100 HP? Take-off distance can be reduced by as much as 40% with a constant speed propeller! This is what a constant speed propeller can do for your airplane. Rate of climb is a function of excess power. Required horsepower over and above that of Vmins (minimum sink airspeed) for level flight translates to power used for climb. A constant speed propeller allows the engine to develop full power at any climb speed (Vx, Vy) thus maximizing climb performance. Rate of climb can be increased by as much as 35% with a constant speed propeller! By adjusting the manifold pressure and rpm, this will allow the pilot to choose a wide range of power settings whether for maximum endurance, maximum range, or maximum speed. Only a constant speed propeller gives the pilot these options. Constant speed propellers make approaches and landings easier and safer. In flight, an engine at idle will create drag due to the slow turning propeller. The less pitch the propeller has the more drag created and conversely, the more pitch the propeller has the less drag created. On the approach to landing sequence, the constant speed propeller is in low pitch (more drag), thus allowing the pilot the option of a steeper more accurate approach than that of a fixed pitch propeller. The landing roll is reduced with the added propeller disc drag. Not only does a constant speed propeller increase the total aircraft performance, but it also decreases the pilot engine management workload. The problem with the RV-3 and constant speed propellers is weight. The traditional Hartzell is simply a LOT of weight to put up there at around 59 lbs for the prop/spinner assembly. Hartzell's have been installed on RV-3s before but they impose CG issues as well as gross weight challenges. Whirl Wind Propellers has introduced what I feel is the perfect solution for the RV-3, their model 151. This is a 3-blade composite propeller that weighs only 31 lbs for the complete assembly including spinner and all fasteners. One local builder weighed his wood prop and by the time he included the necessary prop extension, spinner, and all fasteners, it totaled 28 lbs! In essence, I'm building the airplane around this prop. I tested a previous version of this propeller on my RV-8 and was quite impressed with it, the results of that testing can be found here. For those who might be interested in a Whirl Wind propeller, a bit of background. Whirl Wind was started in the early 90's by Jim Rust and his wife Patti in Southern California. 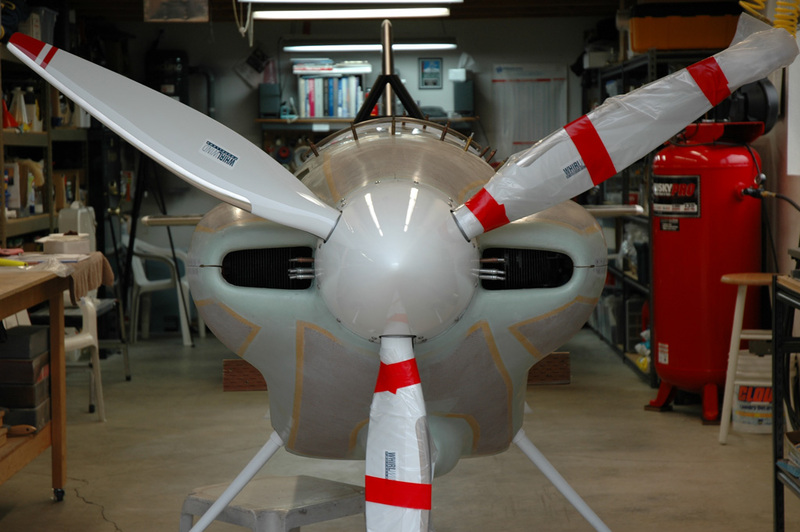 An aerobatic pilot, he began by making knock-offs of MT propellers (fiberglass over wood). Along the way he managed to improve both the design and construction methods finally getting to a series of proprietary designs made entirely from composite materials. In January of 2005 the aviation division of Whirl Wind Propellers was sold to the owner of Titan Aircraft, John Williams, who has formed a new company called Whirl Wind Aviation. John is now manufacturing and selling WW props from Titan's Ohio facility. Jim Rust has stayed involved to assisting with product development, but all manufacturing, sales, customer support are done exclusively out of the Ohio facility. There are two online resources for those interested in WW propellers: a YahooGroups forum, and the Propellers forum at vansairforce.net forums. In May of 2007 owners of Whirl Wind 150 and 151 received Service Letter SL-151-042607. In essence it says that if you are operating a 150 or 151 that the service interval is hereby reduced to 100 hours until the blade ferrules are replaced with a new 151-H steel design. The original ferrules are made of aluminum and were found to fret from contact with the steel ball bearings that allow the blade to rotate. The bearing race in the hub is already steel. This is an unfortunate circumstance but I'm pleased to report that Whirl Wind is standing behind the product and working with each owner in arriving at an agreeable upgrade arrangement. Even though I hadn't flown my prop yet I opted to send it back for an upgrade. Being steel instead of aluminum the new prop will weigh approximately 1 pound more per blade, or 3 lbs more for the assembly. This should fully resolve any ferrule wear issues of course. I'm told that the new ferrule design incoporates several other improvements that address several other small issues they've had also. WW is to be commended for the way they are handling this expensive situation. If you are interested in a WW prop for your RV one of the most important things you'll want to know is "how is the company support?". As you begin your investigation you'll learn that after the Ohio folks bought the company in 2005 there were indeed support issues initially. WW initially did not seem to understand the importance of supporting existing owners and have the resources in place to do so. Due to owner feedback, sometimes strident, WW seemed to get the message however and all the owners now seem pleased with the attitude and staff dedicated to owner support. Now that I'm flying my prop I have encountered a couple of small issues and WW has responded in exemplary fashion. I'm hearing the same thing from virtually all owners so now, in addition IMHO to having the best product options available, they are providing the support needed for long term success. Keep up the good work WW! In the final analysis I'm quite pleased with this prop. Indeed, it is more expensive than some options such as a Hartzell, yet less expensive than others such as an MT, and has a shorter service interval which is certainly an inconveniencel, but the combination of the light weight and the performance of this prop is perfect for this airplane. Kudos to Whirl Wind!